Scott R. Anderson et al., What Mueller Found on Russia and on Obstruction: A First Analysis, Lawfare (Apr. 18, 2019, 11:43 PM), <https://www.lawfareblog.com/what-mueller-found-russia-and-obstruction-first-analysis> (characterizing Mueller’s report as: “creating a rigorous factual record concerning both Russian intervention in 2016 and presidential obstruction of the effort to investigate that intervention” (emphasis added)). On Conlawprof, Professor AAA wrote: “Judge Wright’s findings [from Clinton v. Jones] are no less damning (probably more) than those of Mr. Mueller.” (emphasis added). I, for one, do not see any obvious equivalence between an unbiased independent judge’s “findings” in an opinion after the parties have had notice and opportunity to be heard, and a prosecutors office’s report which attempts to marshal one side of the evidence—where the object of the investigation (i.e., investigation=failed prosecution) has no opportunity to respond. 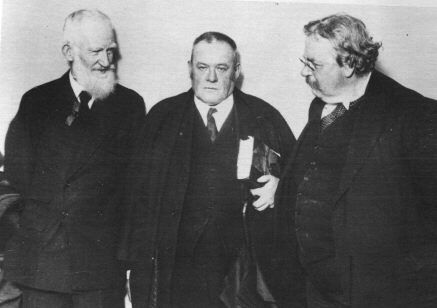 Seth Barrett Tillman, Today—on Lawfare and on Conlawprof, New Reform Club (Apr. 19, 2019, 3:45 PM), <https://reformclub.blogspot.com/2019/04/today-on-lawfare-and-on-conlawprof.html>. Have a look around New Reform Club—my co-bloggers do good work. Professor AAA would you affirm (in line with your prior post) that the death penalty imposed by the International Military Tribunals (IMTs) at Nuremberg, Tokyo, and Manilla were substantially wrongful? I would have no problem explaining to adult third-parties that the reason the IMTs imposed the death penalty was that many of the war criminals remained hugely popular with large numbers of their countrymen (and their soldiers), and, for that reason, the Allies thought it prudent to block their election (or reelection) to public bodies after hostilities had ended. Many believed that WWII followed WWI in part because no such punishments had been meted out after WWI, and that but for the death penalty following the IMTs, the same people would look for a rematch in a WWIII. I don’t know that they were wrong. I think Professor BBB believes the EEC/EU has kept the peace (or helped to do so) in Europe. Some believe it was NATO. Maybe it was Nuremberg and its executions? It is a question I don’t claim to know the answer to. But I would be hesitant to say the Allied authorities, judges, and prosecutors at the IMTs were wrong based on my personal experience as a lawyer (and citizen) during peacetime in the United States. Seth Barrett Tillman, Conlawprof, WWII’s War Crimes Tribunals, and the Death Penalty, New Reform Club (Apr. 18, 2019, 7:19 AM), <https://reformclub.blogspot.com/2019/04/conlawprof-wwiis-war-crimes-tribunals.html>. Welcome Instapundit and ChicagoBoyz readers! Have a look around New Reform Club--my co-bloggers do good work. As to  and , I don’t think most recently formed countries ever thought of building on a foundation absent a written constitution (Israel is somewhat anomalous by this standard), much less absent any norms and conventions. If we, the United States, are recommending that newly formed countries adopt , that is, American-style separation of powers, then such advice is (in my view) positively harmful. I can think of few things more likely to destroy the chances of a new nation’s living at peace with itself and its neighbours than to take on such a system—a system which only worked in the U.S. (to the extent it worked at all—e.g., the American Civil War) for wholly fortuitous reasons (i.e., big oceans as defense in depth and relatively weak neighbours). If this is “soft power,” then it is positively a destructive force in the world. Still, the people who marketed soft power over the last decade in the halls of power and among the voters were more than happy to engage in real politik when it suited them. See President Obama called Libya “a mess” <https://www.vanityfair.com/news/2016/04/obama-clinton-libya-mistake>. There are now slave markets in Libya. I wonder why that is? Secretary of State Clinton on Qaddafi: “We came, we saw, he died”: <https://www.youtube.com/watch?v=mlz3-OzcExI>. She laughs while saying it. Laughs. As to Professor BBB … As long as we are looking to Nuremberg for a model or precedent: Did anyone laugh while the war criminals were executed? Did any of the prosecutors or the proponents of the war-time policies that led to Allied victory in WWII, go on film or radio, and in public discussions of the post-war executions, did they start laughing? I also wonder if there is any cognitive dissonance amongst the participants on CONLAWPROF who:  oppose the death penalty under peace time conditions administered by independents courts and juries; and,  support a concomitant willingness to turn to Nuremberg as a model to guide current standards and thinking? What penalty do you think Jackson and the other prosecutors at Nuremberg (and at the other international military tribunals following Allied victory) sought? “If only we had honest and accurate polls, and if only people took polls as seriously as they do actual voting, and if all these things and more were true, you’d have a point, except the polls and pollsters thought Brexit would lose, thought Hillary would win, and thought Netanyahu in trouble. But none of it was true. None of it. PS to NRC Readers: notice my interlocutor’s use of “actually” and “imagine” as if his points were difficult or novel ideas and concepts. PPS: I have yet to receive a link to any such head-to-head polls, or even any polls showing a majority wants a second vote. Seth Barrett Tillman, Academics and Brexit, New Reform Club (Apr. 13, 2019, 16:25 PM), <https://reformclub.blogspot.com/2019/04/academics-and-brexit.html>. 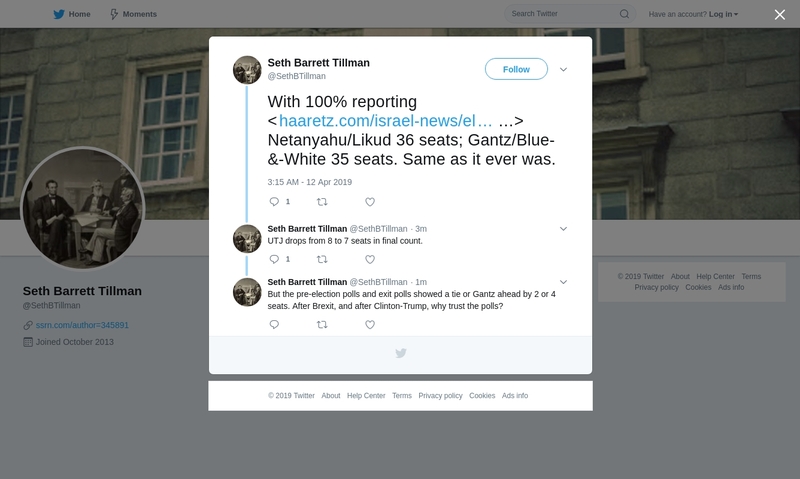 Seth Barrett Tillman, 100% of the Israeli Vote Counted, New Reform Club (Apr. 12, 2019, 6:25 AM), <https://reformclub.blogspot.com/2019/04/100-of-israeli-vote-counted.html>. Today’s Question On CONLAWPROF: Where Would You Put Trump? No new, major land war(s) in Asia—so Trump is ahead of LBJ. No missile crisis risking an exchange of nuclear weapons with a superpower—so Trump is ahead of JFK. No wars of national conquest—so Trump is ahead of Polk (Texas) and McKinley (Philippines, Cuba). No move to war after foreign power made full, reasonable efforts to amicably settle reasons for dispute—so Trump is ahead of Madison (War of 1812). Under Madison, we burned down the capital of British North America (York/Toronto), and they returned the favor in Washington. So Trump beats Madison. No wars against native American tribes—so Trump is ahead of [fill in the blank—many such presidents could be listed here]. No wars based on poor intelligence or to prop up foreign absolute monarchies—so Trump is ahead of both Bush I and Bush II. Trump has not interned 100,000s of US citizens based on race—so Trump is ahead of FDR. Trump has not allowed a U.S. state or territory to go into civil war and then allow its government to be hijacked by the brigands who engineered the civil war—so Trump is ahead of Buchanan (Bleeding Kansas). I still don’t know why President Clinton blew up an aspirin factory or why Secretary Clinton permitted NATO forces and materiel to blow up Libya—so Trump probably comes out ahead of both of them too. Trump is ahead of Woodrow Wilson: World War I, and! his resegregation of the federal civil service. I grant you that being ahead of Wilson is not saying much...but then, the nation survived Wilson, and no one today thinks of Wilson as having lowered the bar vis-a-vis future presidents. Professor ZZZ seems to be worried about this. He wrote: “Having a POTUS so publicly awful along those lines lowers the horrible bar so dramatically that we will pay for years to come.” Really?—Will we pay for it in years to come, or is this just a shabby slippery slope-type argument? I cannot say I see much sense in Professor ZZZ’s references to Roy Cohn. Roy Cohn’s permanent claim to fame is his association with McCarthy and aggressive anticommunism. Trump, by contrast, has been criticized for being too close to Putin. It is not exactly the same; actually, the two are not alike at all. If words and pretty speeches are the measure of a president, then Trump comes up short. The question is whether that is the correct standard for measuring presidents in a dangerous world. Seth Barrett Tillman, Today’s Question On CONLAWPROF: Where Would You Put Trump?, New Reform Club (Apr. 10, 2019, 14:19 PM), <https://reformclub.blogspot.com/2019/04/todays-question-on-conlawprof-where.html>. AFTER: The Times of Israel: “With some 97% of votes counted, Prime Minister Benjamin Netanyahu’s Likud and Benny Gantz’s Blue and White party still appear on track to get 35 seats each…. These results give the right and religious bloc 65 seats, while the center, left and Arab parties have 55.” <https://www.timesofisrael.com/liveblog_entry/after-97-votes-counted-second-arab-party-safely-crosses-threshold/> (Wednesday). 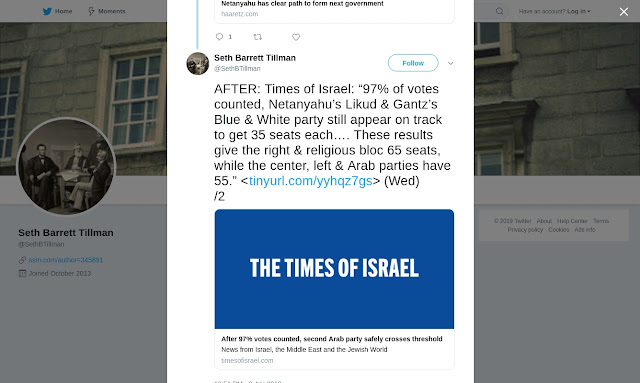 Seth Barrett Tillman, Israeli Election 2019: Before and After, New Reform Club (Apr. 10, 2019, 1:43 AM), <https://reformclub.blogspot.com/2019/04/israeli-election-2019-before-and-after.html>. 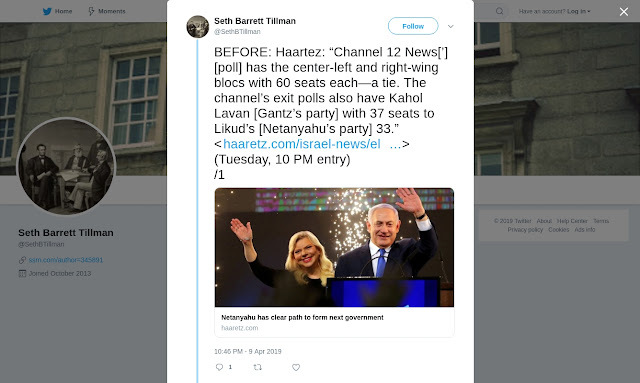 see also: Seth Barrett Tillman, Israeli Election 2019: Netanyahu and the Polls, New Reform Club (Apr. 9, 2019, 3:44 PM), <https://reformclub.blogspot.com/2019/04/israeli-election-2019-netanyahu-and.html>. Seth Barrett Tillman, Israeli Election 2019: Netanyahu and the Polls, New Reform Club (Apr. 9, 2019, 3:44 PM), <https://reformclub.blogspot.com/2019/04/israeli-election-2019-netanyahu-and.html>. Mr Neal Goldfarb, apparently a linguist and Dean’s Visiting Scholar with the Georgetown University Law Center, reached out to me on Twitter. What he had to say was spirited & interesting. You can see the full Twitter exchange here: <https://twitter.com/NealGoldfarb/status/1113863868038754304>. Neal’s chief complaint was that, in my court filings in the Emoluments Clauses cases against the President, I denominated the relevant constitutional provisions: the Foreign Emoluments Clause and Presidential Emoluments Clause, as opposed to the Foreign Emolument Clause and Presidential Emolument Clause. On Friday, April 5, 2019, I sent him a response by e-mail. See below. I have yet to hear back from him. But hope springs eternal. Thank you for reaching out to me via Twitter. New friends are always welcomed—however late they are to join the debate. I have given your paper a once over. I don’t see any citations to my publications or to my co-authored publications with [Professor] Blackman, so I continue to wonder why you tweeted to me and Blackman, but not to [all the] other amici and parties—who all used the nomenclature adopted by plaintiffs in their complaints. It is a real puzzle! If you could find your way to cite my publications, then I will be in a better position to respond. I write a great many responsive pieces: this academic year alone, I have had one article responding to Professor Yoo, a second article responding to Professor Fallon, and a third responding to Chief Judge Eckerstrom. I must give priority in relation to the people who actually cite me, as opposed to other people who just contact me informally by e-mail or by Twitter. I am sure you can understand that. If you still seek a response from me, particularly in the near term, I suggest you cite my publications and/or [amicus] filings in your paper in and around your footnotes 50 & 51—where you suggest the “emoluments” nomenclature is “near-universal.” [Goldfarb: <https://papers.ssrn.com/sol3/papers.cfm?abstract_id=3333512>] You can find my briefs and other [judicial] filings here: <http://reformclub.blogspot.com/2018/02/a-work-in-progress-select-bibliography.html>. You can find my publications here: <https://papers.ssrn.com/sol3/results.cfm?RequestTimeout=50000000>. I will also need some clarification from you in regard to a single point you make several times in your paper. You wrote: “[T]he lawsuits [are] against President Trump alleging that because of certain of his business interests he is in violation of the Constitution’s Foreign Emolument Clause and Presidential Emolument Clause.” (p.5) (emphasis added), <https://papers.ssrn.com/sol3/papers.cfm?abstract_id=3333512>. Again, you wrote: “These two clauses are of course the subject of pending litigation against President Trump.” (p.19) (emphasis added). You make this claim in several other places in your paper. Can you identify for me who or what you mean by “President Trump”—What are you intending? ; What is your meaning? ; What you are trying to communicate? ; and, How you think the reader will understand your writing here?, etc. I assure you, although you might think my question odd, it is not. It is meant seriously, and I intend to quote your answer in my future Response to Neal Goldfarb. My question is not “grammatical wonkery” or “academic wonkery.” I cannot turn to my future Response to Neal Goldfarb until you respond. So let me hear from you, particularly in the near term if you want to facilitate a response from me in the near future. Seth Barrett Tillman, Response to Neal Goldfarb, New Reform Club (Apr. 8, 2019, 1:07 PM), <https://reformclub.blogspot.com/2019/04/response-to-neal-goldfarb.html>. Asking The Important Questions: So Does This Mean Reagan Was Right Or Wrong? Seth Barrett Tillman, Asking The Important Questions: So Does This Mean Reagan Was Right Or Wrong?, New Reform Club (Apr. 5, 2019, 5:05 AM), <https://reformclub.blogspot.com/2019/04/asking-important-questions-so-does-this.html>; <https://twitter.com/SethBTillman/status/1114089216315744256>. 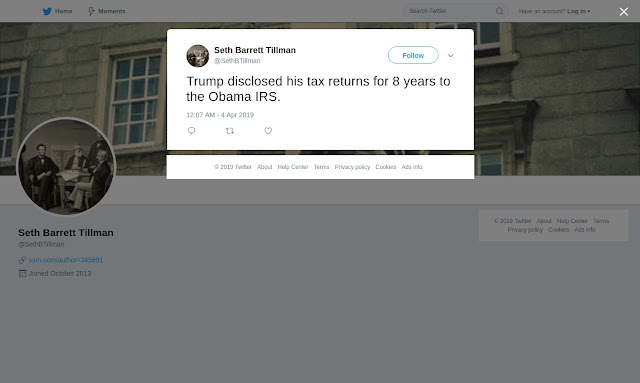 Glenn Reynolds, A REMINDER FROM SETH BARRETT TILLMAN: Trump disclosed his tax returns for 8 years to the Obama IRS, Instapundit (Apr. 4, 2019, 10:04 AM), <https://pjmedia.com/instapundit/326620/>. The Court finds that Plaintiffs’ claims sweep too broadly. There is good reason why their standing should be recognized vis-à-vis the Hotel in Washington D.C., given the immediate impact on Plaintiffs in respect to the Hotel’s operations. It is a considerable stretch, however, to find the requisite injury-in-fact to these particular Plaintiffs that is traceable to the Trump Organization’s or, through it, the President’s conduct outside the District of Columbia. How indeed, for instance, have Maryland or the District of Columbia suffered and how are they suffering immediate or impending injury as a result of whatever benefits the President might be deriving from foreign and state government patronage at the Trump Organization’s Mar-a-Lago property in Florida or in the grant of patents to the Trump Organization or Trump relatives by China? In this respect, the Court, quite simply, sees neither immediate nor impending harm to Plaintiffs. Hence, the Court finds that these particular Plaintiffs lack standing to challenge the operations of the Trump Organization or the benefits the President may receive from its operations outside the District of Columbia. But to be perfectly clear: The Court reaches this conclusion only with respect to these Plaintiffs and the particular facts of the present case. This is in no way meant to say that other States or other businesses or individuals immediately affected by the same sort of violations alleged in the case at bar, e.g., a major hotel competitor in Palm Beach (near Mar-a-Lago) or indeed a hotel competitor anywhere in the State of Florida, might not have standing to pursue litigation similar to that which is in process here. Extract from Judge Messitte’s standing-only opinion in: DC & MD v. Trump, Civ. A. No. 8:17-cv-01596-PJM, 2018 WL 1516306, 2018 U.S. Dist. LEXIS 51365, 291 F. Supp. 3d 725, 753 (D. Md. Mar. 28 2018) (Messitte, J. ), ECF No. 101, <http://guptawessler.com/wp-content/uploads/2018/03/101-Opinion.pdf> (emphasis added). Nothing to see here folks, just move along. Judge Messitte, in Maryland, had time to write all that about non-existent plaintiffs’ standing in non-existent cases to be brought in Florida or elsewhere against the President. But, even after 6 months after briefing was finished, Judge Messitte never managed to schedule an oral argument or to otherwise address the President’s motion to dismiss (in his individual capacity), and then Judge Messitte proceeded to launch discovery, notwithstanding his failing to address the motion. Nothing to see here folks, just move along. The September 2018 CJRA report is now out. See <https://www.uscourts.gov/sites/default/files/cjra_8_0930.2018_0.pdf>. It lists Judge Messitte as having a single motion overdue, that is, past the target 6-month deadline. In fact, Judge Messitte regularly meets expectations in regard to deciding motions. But for some unidentified reason, the President’s motion was not decided in a timely fashion. Nothing to see here folks, just move along. 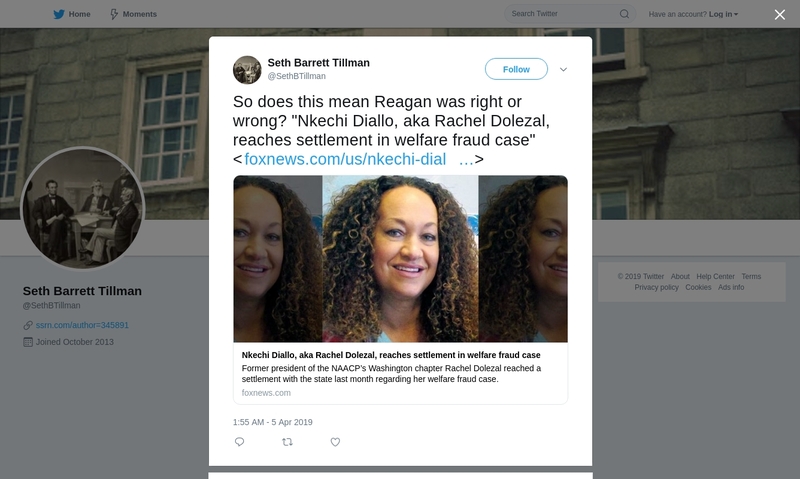 Seth Barrett Tillman, Part VII: The Mystery of DC & MD v. Trump: Maryland Federal District Court Judge Opining About Non-existent Plaintiffs in Non-existent Case in Florida, New Reform Club (Apr. 2, 2019, 7:23 AM), <https://reformclub.blogspot.com/2019/04/part-vii-they-mystery-of-dc-md-v-trump.html>. Seth Barrett Tillman, Part VI: DC & MD v Trump—Can the President of the United States get Married or Divorced?, New Reform Club (Mar. 20, 2019, 6:34 AM), <https://reformclub.blogspot.com/2019/03/part-vi-dc-md-v-trumpcan-president-of.html>. 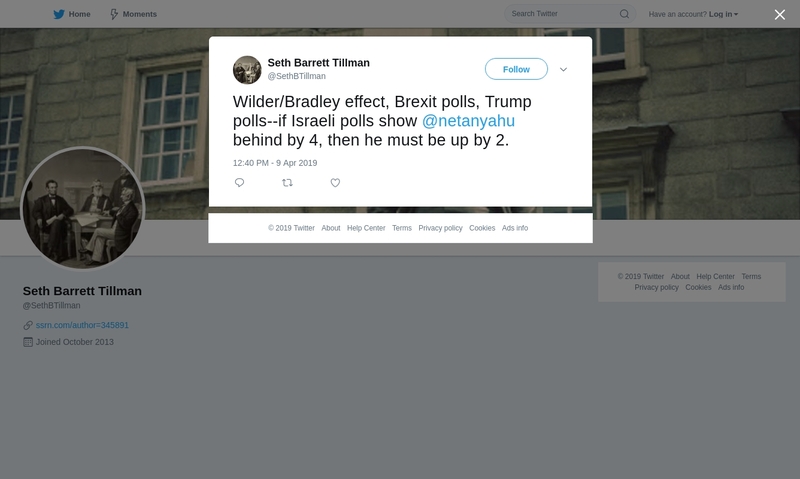 Seth Barrett Tillman, Trump’s 7% Panel, New Reform Club (Mar. 19, 2019, 10:05 AM), <https://reformclub.blogspot.com/2019/03/trumps-7-panel.html>. 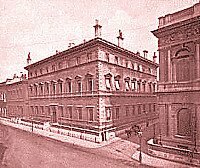 Seth Barrett Tillman, Part V: The Mystery of DC & MD v Trump, New Reform Club (Mar. 12, 2019, 11:30 AM), <https://reformclub.blogspot.com/2019/03/part-v-mystery-of-dc-md-v-trump.html>. Seth Barrett Tillman, Part IV: The Mystery of DC & MD v Trump, New Reform Club (Mar. 11, 2019, 2:04 AM), <https://reformclub.blogspot.com/2019/03/part-iv-mystery-of-dc-md-v-trump.html>. Seth Barrett Tillman, Part III: The Mystery of DC & MD v Trump, New Reform Club (Mar. 10, 2019, 7:13 AM), <https://reformclub.blogspot.com/2019/03/part-iii-mystery-of-dc-md-v-trump.html>. Seth Barrett Tillman, Part II: The Mystery of Senator Richard Blumenthal v. President Donald J Trump, New Reform Club (Mar. 8, 2019, 1:38 AM), <https://reformclub.blogspot.com/2019/03/part-ii-mystery-of-senator-richard.html>. For Part I, see: Seth Barrett Tillman, The Mystery of Blumenthal v. Trump, New Reform Club (Mar. 7, 2019, 2:16 AM), <https://reformclub.blogspot.com/2019/03/the-mystery-of-blumenthal-v-trump.html>. Brief for Scholar Seth Barrett Tillman and the Judicial Education Project as Amici Curiae in Support of Neither Party with Respect to Motion to Dismiss on Behalf of Defendant in his Individual Capacity, District of Columbia & State of Maryland v. Donald J. Trump, in his official capacity as President of the United States of America, and in his individual capacity, Civ. A. No. 8:17-cv-01596-PJM (D. Md. May 8, 2018) (Messitte, J. ), ECF No. 114, 2018 WL 2159867, 2018 U.S. Dist. Ct. Motions LEXIS 32, <https://ssrn.com/abstract=3174268>, <https://www.scribd.com/document/378704459/DC-and-Maryland-v-Trump-Amicus-brief-of-Seth-Barrett-Tillman-in-Support-of-Neither-Party-with-Respect-to-Individual-Capacity-Motion-to-Dismiss>. Letter Brief filing Supplemental Authority, from Seth Barrett Tillman and the Judicial Education Project as Amici Curiae in Support of the Defendant, District of Columbia & State of Maryland v. Donald J. Trump, in his official capacity as President of the United States of America, Civ. A. No. 8:17-cv-01596-PJM (D. Md. Mar. 19, 2018) (Messitte, J. ), ECF No. 97, <https://www.scribd.com/document/374271648/D-C-and-Maryland-v-Trump-Notice-of-Supplemental-Authority-3-19-18>, <https://ssrn.com/abstract=3141732>. Letter Brief, from Seth Barrett Tillman and the Judicial Education Project as Amici Curiae in Support of the Defendant, Seeking an Order in regard to Plaintiffs’ Motion to Amend the Complaint, District of Columbia & State of Maryland v. Donald J. Trump, in his official capacity as President of the United States of America, Civ. A. No. 8:17-cv-01596-PJM (D. Md. Jan. 29, 2018) (Messitte, J. ), ECF No. 88, 2018 WL 1128948, <https://www.scribd.com/document/370301834/Maryland-v-Trump-Correspondence-1-29-18>, <https://ssrn.com/abstract=3112896>. Corrected Response [Brief] of Scholar Seth Barrett Tillman and the Judicial Education Project as Amici Curiae in Support of the Defendant, District of Columbia & State of Maryland v. Donald J. Trump, in his official capacity as President of the United States of America, Civ. A. No. 8:17-cv-01596-PJM (D. Md. Dec. 31, 2017) (Messitte, J. ), ECF No. 77, 2017 WL 6880026, 2017 U.S. Dist. Ct. Motions LEXIS 466, <https://ssrn.com/abstract=3089868>. Motion and Brief for Scholar Seth Barrett Tillman and the Judicial Education Project as Amici Curiae in Support of the Defendant, District of Columbia & Maryland v. Donald J. Trump, in his official capacity as President of the United States of America, Civ. A. No. 8:17-cv-01596-PJM (D. Md. Oct. 6, 2017) (Messitte, J. ), ECF No. 27-1, 2017 WL 4685826, 2017 U.S. Dist. Ct. Briefs LEXIS 410, <https://ssrn.com/abstract=2996355>.